Simple and easy design colored in bright, clear and visible statistics, no aggressive pop-ups or discount offerings. 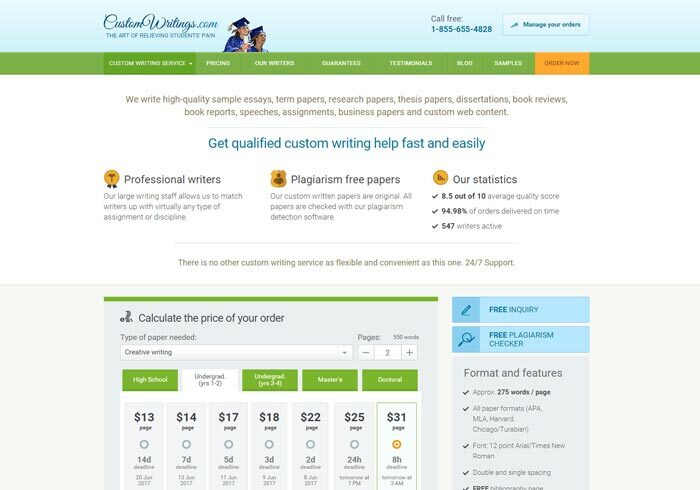 This is how we first met with customwritings.com essay writing service homepage. First of all, authors working for this service write all the texts from scratch, whether you order an essay, a term paper, a research paper, a coursework, an assignment, a report or anything. Admission services include scholarship essays, application, entrance essays, or personal statements. There are even services on academic ghostwriting, lab reports, or paper formatting. Customwritings.com works with papers of different levels: from high school essays to doctoral orders. Every order can be delivered to the client even in 8 hours. Quite good speed, but the service is not the fastest one among available companies. The website allows every client to count an estimate price or the required order at once, displaying the comfortable and user-friendly calculation form before your eyes when you enter the page. It’s not a pop-up, and it won’t hurt your nerves in case if you’re stressed with the upcoming deadline. The prices displayed are something around average, but customwritings.com can’t be called the cheapest service ever. Though, inquiry, revisions and plagiarism report are all available for free. The same thing is for 24/7 customer support service: we didn’t notice any paid VIP support offerings. Supported payment methods include PayPal, Visa, Skrill, MasterCard, American Express and Discover services. We find this more than enough. Besides, the company promises a 100% money back guarantee in case if you’re not pleased with the quality of the received writing. To summarize, customwritings.com can’t be named excellent due to the prices they offer. Sample essays here are good, yet they can’t show you the whole picture. So, we’ve decided to check it on our own. And got disappointed. Even the simplest essay on literature we’ve ordered from this service was full of mistakes and didn’t keep up to the topic. That’s not what the user expects to get when reading such a cool website description.